At five o’clock, if thick rain clouds aren’t blocking out the sun, the sky is still light. For me, that is a marker of a change of seasons, not the seasons of winter-to-spring, but of winter-darkness to end-of-winter light. I’ve been in the PNW long enough to know that spring doesn’t come until it’s official, and spring weather isn’t even guaranteed as late as June. Cherry trees may bloom, only to have the blossoms turn to wet slurry in March and April rain. This is the place I call home, with my heart. Morissey’s autobiography is a long lyric, a stream-of-consciousness memory, like listening to his thoughts. Manchester-recalled is a dark and dreadful place. I feel glad to have a cheat sheet scrawled from mystery-thrillers and BBC America to help me understand things unexplained. Don’t judge me. The thing I will codename Project E is at 85,500+ words. Good heavens. I’ve been writing it for a year. Great googly mooglies. It’s the equivalent of making bacon brownies. It’s fun, and at the same time, I’m ready to flourish “the end” and give attention to an entree. I’m concurrently writing and rewriting EA, the magic girl serial. I say that, and I think of all the other stories in various states of waiting. It’s why I blog so rarely. Time, divided. I’m always coming across tidbits that fit interestingly into this one or that one. My stories are like shoeboxes, and I will take one from lower on the stack and open it to pop something in (e.g. robot camel jockies), and then spend hours daydreaming through the collection. In fact, I keep an “Idea Book” to reduce the number of metaphorical shoeboxes. I’m a slow writer. I’ve found myself worrying what will happen if I don’t write them all. Technical difficulties mean doing editing on a short story for my writing group’s anthology in fits and starts. It’s not a bad story, but I rather wish I had gone with something more in my usual style and topic of interest, instead of something I thought would push my edges outward. But revising always makes any story dire and unpleasant to look at, while the revising is ongoing. I have that on good authority, too. Now that my air-drying clay beads are dry, I need to take advantage of a dry day and gloss coat them. I have two different spray glosses, and limited number of beads. My plan is to split them into two similar groups and then compare the finishes afterward. 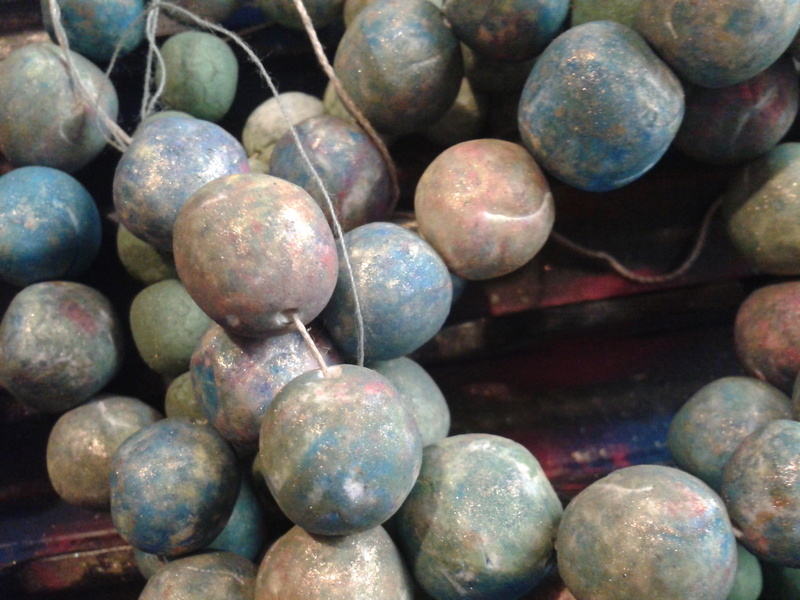 The clay beads are colored with a mix of metallic mica and toner (as in, printer cartridge) dust. Upcycling! These questions were created by Jaime Morrow for her weekly blog hop. At the moment, I am between books. I just gave up on a fantasy novel with terrible gender politics. I was hoping that the protagonist would start showing some character growth, but someone who had already read the same book told me it never happens. Alas. It had a good premise. That said, I have bookmarks in Fic by Anne Jamison and in a collection of Sherlock Holmes short stories that claim to be pastiches. Even though I’m not completely done with the structural planning of Even Angels (working title), my “magic girl” novel in serial, I gave in and started writing a bit of it out. I’m not sure, but I may do much of this pen-and-paper. It’s a good time for magic girls. It seems that Disney is going to be rolling out a series this fall. Cardcaptor Sakura is newly licensed for North America, and Sailor Moon has a new dub and a reboot, both available for watching on Hulu.com. There’s also the Ladybug animated film, which will be a darling mix of French movie making with the tropes of Japanese anime. I’m looking forward to it! It’s summer! I haven’t been able to go camping, but I still hope to do so after Labor Day. And by camping I mean sitting around under the evergreens and writing and daydreaming. I did get to see Trek in the Park, which is like Shakespeare in the Park but ST:OS episodes. This one was “Mirror, Mirror,” the bearded Spock episode. Completely made of win. I am shocked that this group has been performing for four years, yet I just found out about them this year. You are currently browsing entries tagged with what’s up wednesday at Cris de Borja.